Have you ever considered driving a zero-emission electric vehicle to avoid volatile gas prices and high maintenance costs of traditional cars and trucks? 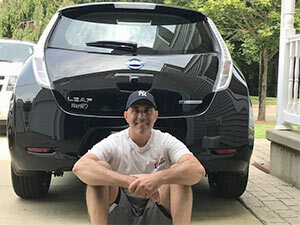 If you haven’t, you should really give EVs another look and join a growing number of people who are making the switch. The technology is improving rapidly, and these cars offer a smooth ride, quick acceleration, and very low maintenance and fuel costs. A common objection to EVs stems from range anxiety, the fear caused by concerns about running out of power in a limited range vehicle. This doesn’t happen with traditional vehicles, as gas stations are easy to find in most places. A vehicle’s range should be a purchase consideration, but not a deal breaker. Some battery electric vehicles have a range as low as 62 miles, while others can travel distances of 335 miles on a single charge. If you are like most working Connecticut residents, EVs are a good choice for your commute. The 2015 Fast Facts from the Connecticut Department of Transportation found that 95% of residents travel less than 50 miles to work each day. There are over 400 public charging stations in Connecticut, and more – and faster – chargers are steadily getting installed. (Maps of public charging stations can be found at EVConnecticut, PlugShare, or through network providers such as ChargePoint and EVgo.) Most EV drivers charge at home, and take advantage of public stations as needed at workplaces, destinations, and along travel corridors. EV drivers say they are mindful about the limits of their charge, however proper planning and switching from the fastest route to the shortest distance helps. Apps and in-vehicle systems help drivers find charging stations just like they were gas stations. And again, an advantage of EVs is that drivers can also fuel up at home or work – wherever there’s a plug. EVs also tend to have powerful regenerative braking systems (like hybrids do) to help feed the engine battery. Avoiding the gas station and repair shop are not the only ways EV drivers see savings. The Connecticut Hydrogen and Electric Automobile Purchase Rebate (CHEAPR) can reduce a purchase or lease price by several thousand dollars, and a federal tax credit of up to $7,500 is still available. Some dealerships also run specials that offer deep discounts of their own or from manufacturers. The Connecticut Green Bank has partnered with three local lenders (CorePlus Credit Union, Mutual Security Credit Union, and Nutmeg State Financial Credit Union) and local car dealerships to offer Smart-E for EV loans on new or used EVs for a limited time. With maximum loan amounts of $30,000 and terms up to 72 months, it’s never been a better time to purchase an EV. The year 2018 will mark the release of the most advanced models yet. If electricity is the fuel source for your car, and your house has solar photovoltaic (PV) panels, you could effectively drive for free. “If you have solar panels and produce excess power, it pays for itself,” said Paquette. 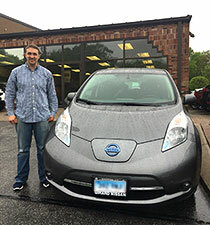 When Corsi installed solar panels at his home in Milford, he was looking ahead to adding an EV within five years for this reason. “Our solar panels are providing benefits beyond a lower electricity bill,” said Corsi. If you already own or lease an EV, but do not have solar on your home, the Smart-E Loan can help. The loan would allow you to finance the total cost for the installation of solar and/or a charging station at your home with a low fixed rate and flexible terms. Lastly, don’t overlook the environmental and lifestyle benefits of an emissions-free ride. Tailpipe emissions are the largest contributor to air pollution in Connecticut, and switching to an EV can make a difference with a clean ride. For Corsi, his EV has triggered some positive lifestyle changes. Both Corsi and Paquette have received their share of compliments on their new EVs. Rocky Hill, CT (August 2, 2017) – As solar installations in Connecticut continue to increase, the Department of Consumer Protection (DCP), the Office of Consumer Counsel (OCC), and the Connecticut Green Bank want to remind residents that informational resources exist to help guide them through the process of adding solar photovoltaic (PV) systems to their homes. Two suggested resources are GoSolarCT.com and DCP’s Solar Panel Buyer’s Guide. As of July 2017, nearly 25,000 state residences have installed solar, producing more than 175 MW of clean, renewable power. Through GoSolarCT, the Connecticut Green Bank seeks to make information on the solar process available in one location for homeowners in the state. GoSolarCT shares pertinent information in an easy, interactive way for Connecticut homeowners and includes a glossary of terms, a potential energy savings calculator and a list of frequently asked questions and answers. The Connecticut Green Bank was established by the Connecticut General Assembly on July 1, 2011 as a part of Public Act 11-80. As the nation’s first full-scale green bank, it is leading the clean energy finance movement by leveraging public and private funds to scale-up renewable energy deployment and energy efficiency projects across Connecticut. The Green Bank’s success in accelerating private investment in clean energy is helping Connecticut create jobs, increase economic prosperity, promote energy security and address climate change. For more information about the Connecticut Green Bank, please visit www.ctgreenbank.com. For more information, contact: Rudy Sturk, Senior Associate, Marketing, Connecticut Green Bank, at (860) 259-1154 or [email protected]. The Department of Consumer Protection’s mission is to ensure a fair and equitable marketplace, safe products and services for consumers in the industries that we license, regulate and enforce. The Department has seven divisions with their own areas of expertise: Drug Control, Foods and Standards, Investigations, Gaming, Licensing, Liquor Control, Occupational and Professional Licensing, and Trade Practices. The Department also administers 18 professional Boards, Councils and Commissions. For more information, contact: Lora Rae Anderson, Director of Communications, Department of Consumer Protection, at (860) 713-6019 or [email protected]. The Office of Consumer Counsel (OCC) serves as a strong independent voice for Connecticut’s public utility and telecommunications consumers through advocacy and customer education. The OCC is authorized to participate on behalf of consumers in all administrative and judicial forums and in any matters in which the interests of consumers with respect to public utility matters may be involved. For more information, contact: Joseph A. Rosenthal, Principal Attorney, Office of Consumer Counsel, at 860-827-2906 or [email protected]. Over the past several years, Connecticut Green Bank has partnered with the affordable housing sector and private capital providers to provide critical education, financing, technical assistance and resources that address barriers to deployment of clean energy projects in affordable housing properties. In March 2017, Connecticut Green Bank strengthened its commitment to the state’s low-to-moderate income residents by welcoming Betsy Crum, a veteran professional in affordable housing development and finance, to its board of directors. The Green Bank Network held a webinar on the approaches the Connecticut Green Bank is taking to increase financing for clean energy in affordable housing properties and how Crum’s appointment to the Board will push the bank even further in its efforts. The recording of the webinar is below. March 23, 2017 – Though a mature technology, renewable thermals occupy a small niche in Connecticut — and in the U.S. at large. A new Yale-led study analyzes the market potential of this technology across the state and provides key insights into spurring consumer demand. According to the analysis, led by the Yale Center for Business and the Environment (CBEY), renewable thermals have significant market potential in the state if supported by appropriate public policy and financing tools. Renewable thermal technologies comprise a range of products—from solar water heaters to district energy systems — all designed to use renewable energy in the cooling of space and the heating of both space and water. Collectively, the use of energy for thermal purposes accounts for roughly one-third of all U.S. energy consumption. In Connecticut, over 60 percent of the energy used in residential and commercial buildings is for space heating and cooling; this demand, combined with the energy used to heat water, account for 30 percent of the state’s greenhouse gas emissions. Switching from conventional fossil fuel providers of thermal energy to RTTs could offer significant cuts in greenhouse gas emissions — of particular relevance as Connecticut aims to reduce emissions to 80 percent below 2001 levels by 2050. “Renewable heating and cooling are not as visible or high profile as renewable electricity, but holds an enormous reservoir of possibility for utilizing local resources to off-set fossil fuels. Like renewable electricity, renewable heating and cooling need supportive policies and financing products to kick start a viable market,” says Helle Gronli, associate research scientist at the Yale School of Forestry & Environmental Studies (F&ES) and director of the Feasibility of Renewable Thermal Technologies in Connecticut project (FORTT). The FORTT team is based at the Yale Center for Business and the Environment (CBEY) and is part of a larger coalition that includes the Connecticut Department of Energy and Environmental Protection, Eversource Energy, the United Illuminating Company, and the Connecticut Green Bank. CBEY is based at the Yale School of Forestry & Environmental Studies and the Yale School of Management. The first part of the study analyzed the market potential of RTTs in Connecticut through 2050. The findings suggest that RTTs could competitively serve 19 percent of thermal demand in buildings across the state. Annually, this represents the curtailment of 1.4 million tons of CO2e emissions. However, realizing Connecticut’s overall goal requires a considerably higher rate of RTT deployment than what currently is found competitive. Public institutions, which tend to be both large property owners and heavy energy users, should show direction by adopting RTTs internally and establishing external regulation (e.g. building codes) to encourage the development of the nascent market and increase customer awareness. Innovative financial products and strategies to improve the value proposition of RTT investments are needed to help the financing of RTTs achieve scale; this, in turn, will reduce upfront costs. Resources must be deployed to develop a competent and competitive regional industry. A well-supported and trustworthy base of installers and experts focused on the RTT industry directly supports consumer trust in this new market. New policies should be considered to create value streams attached to RTTs. Thermal renewable energy credits, carbon pricing and voluntary markets for clean energy are clear examples, as are building certification schemes through which property value and market rents reflect efficient thermal technologies. On the supply side, the study shows that clear policy guidelines and standardized regulatory processes are needed to build a fluid and efficient RTT market. Among consumers, RTTs tend to suffer from a deficit of awareness. Marketing campaigns to raise their profile, similar to Connecticut’s recent “Solarize” campaign, could go a long way to increasing demand and lowering soft costs. These efforts could be paired with financial tools, whether block grants or leasing agreements, to help defray upfront installation costs—one of the central barriers to adoption. Download full copies of the reports here. North Haven, CT (March 22, 2016) – Work is nearly completed on a new solar energy exhibit at the Energize Connecticut Center in North Haven. The exhibit, being installed with the help of students from E.C. Goodwin Technical High School and Platt Technical High School, will allow children and adults to learn about the benefits of solar. The Energize Connecticut Center is a place where adults and children may experience hands-on learning of energy efficiency and renewable energy concepts and solutions. The facility is a museum and a resource center, staffed by individuals who help Connecticut residents and business owners make smart energy choices. The Energize Connecticut Center is part of the Energize Connecticut initiative, an effort of the Connecticut Green Bank, the State, Eversource, The United Illuminating Company (UI), the Connecticut Natural Gas Corporation (CNG) and The Southern Connecticut Gas Company (SCG). The new solar exhibit educates people and businesses on the benefits of using solar energy. It also teaches people how the technology works, describes the different steps in the process of going solar, and explains different ways to pay for solar such as different types of available financing structures. The exhibit was funded by the Connecticut Green Bank with the goal of educating Connecticut citizens and making the benefits of green energy clear. The solar panels at the exhibit are being installed by students from the Connecticut Technical High School System. The school system trains students on how to properly install solar panels, preparing them for careers in the solar industry and equipping them with mastery of other technical skills. A recent survey from the nonprofit research group The Solar Foundation projects that solar jobs in Connecticut will grow by 6.8% in 2016, underscoring the importance of preparing students to work in this rapidly growing industry. The Green Bank, which administers the Residential Solar Investment Program, an incentive program for homeowners who are going solar, reports that more than 17,000 homeowners in the state have already made the decision to go solar. The Green Bank offers financing programs for homeowners and business owners that make solar and other energy improvements more accessible and affordable. Visitors are welcome to see the new exhibit at the Energize Connecticut Center, located in North Haven, Connecticut at 122 Universal Drive North. The Hours of operation are Monday – Friday 10:00 a.m. – 6:00 p.m. and Saturday 10:00 a.m. – 4:00 p.m. Admission is free. The Connecticut Green Bank was established by Connecticut’s General Assembly on July 1, 2011 as a part of Public Act 11-80. This new quasi-public agency superseded the former Connecticut Clean Energy Fund. The Green Bank’s mission is to lead the green bank movement by accelerating private investment in clean energy deployment for Connecticut to achieve economic prosperity, create jobs, promote energy security and address climate change. As the nation’s first full-scale green bank, the organization leverages public and private funds to drive investment and scale-up clean energy deployment in Connecticut. For more information about Connecticut’s Green Bank, please visit www.ctgreenbank.com. Bridgeport, CT (July 21, 2015) – Governor Malloy toured the house of Susan Young in Bridgeport on Tuesday,to view the installation of solar power and energy efficiency measures –financed through a public-private partnership between PosiGen Solar Solutions and the Connecticut Green Bank. The innovative financing program combines a solar lease with an energy savings agreement to lower the energy burden of participating households. Accompanying the Governor wereBryan Garcia, president and CEO of the Connecticut Green Bank, Thomas Neyhart, CEO of PosiGen, and Chris Anastasi, Sustainability coordinator for the City of Bridgeport. In a concerted effort to extend the reach of the Governor’s renewable energy policies, the Green Bank teamed up with PosiGen, a New Orleans solar company that recently located its New England business in Bridgeport, CT.Focused on closing on what many see as a clean energy affordability gap, the partnership is designed to give people like Ms. Young access to an affordable solar leasing structure that will deliver energy savings for this often overlooked market segment. The Connecticut Green Bank (formerly the Clean Energy Finance and Investment Authority) was established by the Connecticut General Assembly on July 1, 2011 as a part of Public Act 11-80. As the nation’s first full-scale green bank, it is leading the clean energy finance movement by leveraging public and private funds to scale-up renewable energy deployment and energy efficiency projects across Connecticut. The Green Bank’s success in accelerating private investment in clean energy is helping Connecticut create jobs, increase economic prosperity, promote energy security and address climate change. For more information about the Connecticut Green Bank, please visit www.ctgreenbank.com. York. PosiGen’s unique services and products make solar energy affordable to homeowners ofall income levels, and offer individuals, families and businesses the opportunity to achieve greater fiscal autonomy and energy independence by lowering their utility bills. To learne verything about PosiGen, please visit www.posigen.com. Hartford, Conn. (March 17, 2015) – More than 100 clean energy supporters from across Connecticut gathered at the Legislative Office Building in Hartford today to celebrate the state’s successful clean energy efforts during a forum hosted by the Connecticut Green Bank and Renewable Energy and Efficiency Business Association (REEBA). The Forum on Connecticut’s Clean Energy Economy focused on the state’s leadership in helping its residents and businesses access clean, affordable energy and celebrated several initiatives including achieving Governor Malloy’s and the Legislature’s goal of deploying 30 megawatts (MW) of residential rooftop solar PV by 2022, which has been completed eight years ahead of target and significantly under budget. Forum attendees included members of the Connecticut Legislature; solar industry and energy efficiency supporters; capital providers that offer financing for clean energy projects; business customers from across the state that have implemented clean energy projects. The forum also included three panel discussions. The first panel discussion focused on Connecticut’s solar market and was moderated by Kerry O’Neill, Managing Director of Residential Programs at the Connecticut Green Bank. Panelists included Shaun Chapman, Senior Director of Policy & Electricity Markets at Solar City; Mickey Toro, owner of C-TEC Solar; and Bernie Pelletier, Community Outreach Manager at SmartPower. The second panel discussion focused on the successful Energize Norwich pilot campaign, which converted residents and businesses to cleaner and cheaper natural gas using a group purchasing discount model and access to financing from local lenders. The panel was moderated by O’Neill and included panelists Jeff Brining, Energy Services Division Manager at Norwich Public Utilities; John Mancini, Senior Vice President at Eastern Savings Bank; Ray Currier, Chief Operating Officer at CorePlus Federal Credit Union; and Rick Hatch, owner of R&W Heating Energy Solutions. The final panel focused on the Commercial Property Assessed Clean Energy (C-PACE) program, the most successful program of its kind in the nation that also is celebrating its two year anniversary. C-PACE allows commercial property owners to access low cost financing for energy upgrades. The panel was moderated by Genevieve Sherman, Acting Director of Commercial & Industrial Markets at the Connecticut Green Bank and included panelists David Ford, Comprehensive Solutions Account Executive at TRANE U.S., and Jeff Bishop, Director of the Center for Sustainable Business Growth at Bridgeport Regional Business Council. For more information on Connecticut’s clean energy economy and the Governor’s new solar proposal, please download the Get More with SHREC PDF. The Connecticut Green Bank was established by Connecticut’s General Assembly on July 1, 2011 as a part of Public Act 11-80. The Green Bank’s mission is to lead the green bank movement by accelerating private investment in clean energy deployment within Connecticut and to achieve economic prosperity, job creation and energy security throughout the state. As the nation’s first full-scale green bank, the organization leverages public and private funds to drive investment and scale-up clean energy deployment in Connecticut. The Renewable Energy and Efficiency Business Association promotes the sustainable deployment of renewable energy, energy efficiency, and demand-side management. REEBA was formed in 2010 to promote and give voice to a united clean energy industry. REEBA’s membership includes project developers, energy services companies, and an array of electricity end-users including municipalities, schools, and commercial and industrial companies interested in implementing clean energy technologies. For more information about REEBA, please visit www.reeba.org.